How To Improve Your Practice's Front Desk Collections? Many physicians still hold the traditional belief that their front desks are a cost, not a profit, center. However, in the modern world of healthcare, while a front desk can certainly be a cost center, a practice's profitability is often dependent on making front desks a profit center. The changing face of the healthcare industry and medical practice management has made this front desk staff attitude a necessity--not a practice luxury. The factors requiring front desk employees to recognize this requirement are many. The most important reasons for physicians to encourage or mandate a collections approach for their front desk personnel include the following factors. * Installation of Meaningful Use 2 regulations. These are but the most important factors influencing the philosophy and behavior of front desk personnel as primary collectors. While this attitude has been vital to practice profitability for at least five years or longer, front desk collections is now a necessity because of the noted factors. The risks of not treating the front desk as a profit center impact more than profitability. The fallout from not staffing a front desk properly or adequately leads to the following negative results, at a minimum. * Front desk employee "burnout,"
* Crowded, disorganized work space, increasing employee and patient dissatisfaction. Not instilling an outstanding customer service philosophy in front desk staff provides unwelcome results in both short- and long-term situations. Conversely, encouraging front desk employees to adopt a superior customer service and profit philosophy can increase practice collections by 5 to 10 percent. The phrase, "You never get a second chance to make a good first impression," is never more true than with a practice's front desk. Patients form opinions, consciously or subconsciously, about a physician's quality of care by viewing the front desk area and staff communications. A disorganized, crowded front desk area and unacceptable personnel behavior diminish patients' evaluation of the care they are about to receive. However, a neat, organized front desk, with welcoming staff, heightens patients' perceptions of the care they'll receive. According to the St. Louis Pediatric Associates, Inc., having multiple (up to 10) physicians, they use a "Snap" introduction to welcome patients and their adult caregivers. * Making a positive Parting comment. Higher copays and high-deductible health insurance coverage mandate that front desk collections increase to better ensure profitability. Research indicates that copays and front desk collections can account for up to 20 percent of a practice's revenue currently. To say that indication is significant is an understatement of reality. Front desk collections typically involve two components at a minimum. * Collecting previously incurred, but overdue, balances. Increasing front desk collections is not terribly difficult. In fact, it is relatively easy. Here are some simple tips that work. * Ask patients (with a sincere smile), "Did you realize you had an outstanding balance?" * Install a credit/debit card device at the front desk, making it convenient for patients to settle copays, deductibles and outstanding balances. * Keep front desk staff up-to-date on each patient's account standing and current insurance plan. * Always verify patients' in-force health insurance coverage--and its terms. 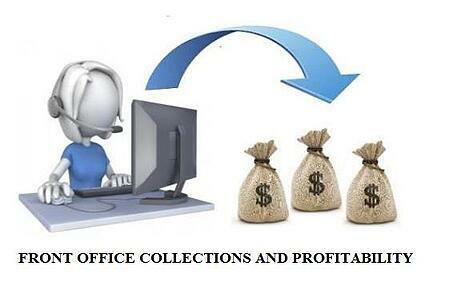 These simple steps for personnel to follow will increase front desk collections enormously. Along with increasing the practice's cash balance on a daily basis, these tips will help keep claim delays and denials to a minimum. Along with increasing revenue, treating a front desk as a profit center changes the mindset of staff, physicians and practice managers. This change in approach makes this group more efficient, reinforces the wisdom in outsourcing medical billing functions and creates a more pleasant job and patient experience.